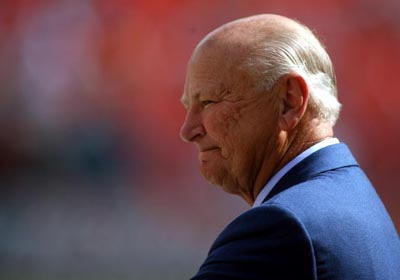 H. Wayne Huizenga, the founding owner of the Florida Marlins and Florida Panthers, as well as the former owner of the Miami Dolphins, died ThursdayMarch 22 2018 night at his home. He was 80. Huizenga, a billionaire who made his fortune creating Fortune 500 companies such as Waste Management Inc., Blockbuster Video and AutoNation, simultaneously owned all three sports teams from 1994 to 1998 -- the first man to own teams in three major sports leagues. His net worth in 2017 was reported to be $2.8 billion, according to Forbes Magazine. After buying 15 percent of the Dolphins and 50 percent of the team's stadium from the family of team founder Joe Robbie in 1990, Huizenga became sole owner of the NFL team in 1994 for $168 million after persuading the league to waive its ban on cross-ownership of teams in other leagues. He turned a nifty profit by selling the Dolphins and their stadium in 2008 to New York real estate billionaire Stephen Ross for $1.1 billion, nearly seven times what he paid to become sole owner. He sold the Marlins to John Henry in 1998. Three years later, he sold the Panthers to Alan Cohen. Starting with a single garbage truck in Pompano Beach, Florida, in 1968, Harry Wayne Huizenga, a college dropout from the Chicago suburbs, built Waste Management Inc. into a Fortune 500 company. He purchased independent sanitation engineering companies, and by the time he took the company public in 1972, he had completed the acquisition of 133 small-time haulers. By 1983, Waste Management was the largest waste disposal company in the United States. The business model worked again with Blockbuster Video, which he started in 1985 and built into the leading movie rental chain nine years later. In 1996, he formed AutoNation. Huizenga is survived by his children Ray (Jennifer), Pamela (Jay), Wayne Jr. (Fonda) and Scott; and 11 grandchildren. Successful Seniors who will not retire!